Of all the interviews I’ve conducted since I began my career in the early 1980s, few (if any) have become more personal than the Q&A session I had with Galadrielle Allman on October 27th of this year. 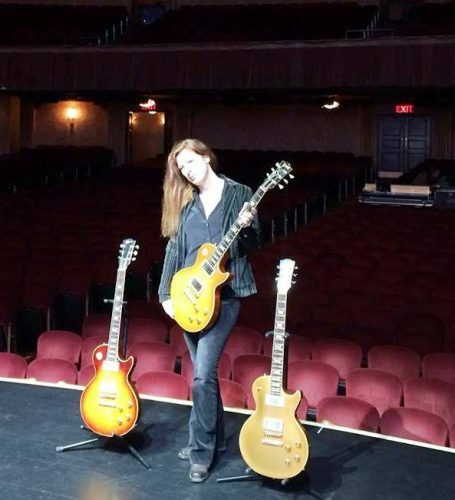 Galadrielle is the daughter of Duane Allman, a guitar icon and the co-founder of the Allman Brothers Band. Duane tragically lost his life in a 1971 motorcycle accident when Galadrielle was just two years old and his band was beginning to realize its potential for success. The opportunity to interview Galadrielle came together at the last minute. Late in the afternoon on the day prior to the interview, I was asked by Al Neff, the Program Director of WXYG in Sauk Rapids, Minnesota, if I could pinch-hit for him as Galadrielle was doing as series of Q&A sessions through the Premiere Radio Group. The publicity blitz was part of an effort to promote the vinyl release of the Skydog Retrospective, a box set which covered the recording career of Duane as a highly in-demand session musician and his work related to the Allman Brothers. Galadrielle is also the author of Please Be With Me, A Song For My Father Duane Allman. I had a heard an interview with her on NPR at the time of the book’s release in 2014. The interview on Fresh Air was very interesting and I picked up copy of Galadrielle’s book a few months later. As I began reading the first pages, I became captivated by the author’s voice that Galadrielle had developed for her book. Through her interviews with family and those who knew her father, she developed a style and the ability to place her readers within moments in time with an emotional perspective that made the reader experience Duane’s life with an entirely new appreciation of his music and legacy. As I read through the pages, the narrative chords that Galadrielle struck with her book were as impactful and soulful as one of her father’s guitar solos. The opportunity to interview Galadrielle was one I couldn’t pass up. I had been involved with an interview that Al had conducted with Gregg Allman in April of 1983 as part of some of the work we did for KVSC-FM, the college radio in St. Cloud, Minnesota. Al and I also led an interview in the summer of 1983 with Dickey Betts and Chuck Leavell. I had been to Allman Brothers Museum at The Big House in Macon, Ga. I had seen Duane’s Gold Top guitar on display the Big House Museum and I was able to see another of Duane’s guitars at the Rock and Roll Hall of Fame in Cleveland this summer. I was more than ready to participate in the interview with Galadrielle. Yet, as I looked at my questions, I wanted to go beyond some of the typical/obvious questions and look at Duane’s life and his music through the narrative that Galadrielle had shared in her book. Like so many fans, I discovered Duane’s brilliance as a guitar icon and his passion as the leader of the Allman Brothers several years after he lost his life just a couple of weeks short of his 25th birthday. I can recall as a teenager marveling at the Allman Brothers’ Live at Fillmore East, a recording Rolling Stone magazine ranked as No. 2 all-time behind James Brown’s Live at The Apollo. I wore out side three of the record listening to “You Don’t Love Me” — waiting for Duane’s “Joy To The World” riff to appear in the final seconds of that performance. After always wondering how did Duane turned the end of a 19-minute jam into my favorite Christmas carol, I found myself asking the same questions so many fans have posed over the years: Why couldn’t Duane have been given more time? What if he never had the motorcycle accident? Where could he have taken his music? In one interview I heard Gregg Allman give, he was able to perfectly sum up his brother’s untimely death and brief life in this succinct fashion: “Short-changed,” Gregg said, expressing the loss in a way that resonates from a family and a fan perspective. Selfishly, as a fan of Duane and the Allman Brothers, I had never taken the time think about the loss of Duane from a family perspective. For me, it had always been about the music. Yes, Duane Allman is one of the best guitar players to ever walk this planet, and, considering what he accomplished with a guitar in his hands during his very short time on earth, I believe an argument can be made that he deserves some consideration for the top spot on the all-time list. But more than Duane Allman the guitar master and band leader extraordinaire was lost that October day in Macon 45 years ago. Duane Allman, the Brother and Friend; Duane Allman, the Son; and Duane Allman, the Father, were all lost that day to those who knew and loved him. In my shortsightedness, I had spent very little (if any) time thinking about how the devastation that Duane’s sudden passing had impacted his family and friends until I began reading Galadrielle’s book. With my Q&A session scheduled just two days prior to the 45thanniversary of Duane’s passing, the winds of fate provided me with an opportunity to experience first-hand how Galadrielle had become a vital part of carrying the torch of her father’s legacy while demonstrating her unique ability to triumph over tragedy. As the interview began with Galadrielle, I was deeply appreciative of the thought and care she gave in each of her answers. Sometimes, people can be understandably guarded when they are doing media interviews. But, in working through writing the book and co-producing the retrospective box set, it was clear that Galadrielle had a great deal to share as a result of what she acknowledged during our interview had been a labor of love and a process of self-discovery. In addition to painting a moving portrait of her father, Galadrielle’s book has the power to effectively speak to those people who have lost a parent or a loved one – particularly those who experienced that loss at a young age. As she related to me during the interview, one of her goals with the book was to show people that it’s possible to carry your loved one with you while moving forward in life. For Galadrielle, part of this process has been the opening of her heart to those who have loved her father’s music through the years. When the anniversary of her father’s passing arrives on October 29th, Galadrielle said she takes time that day to light a candle while listening to some of Duane’s music. It allows her to pause and reflect on her father as well as those who have been fans of his music. Galadrielle’s answer to my question about October 29th jumped out at me like a page from her book. In the hundreds (if not thousands) of interviews I had conducted over 30 years of working in journalism and communications, I can’t recall ever having the opportunity to ask someone how they commemorate the passing of a loved one. Quite frankly, it’s one of the most person questions that a writer/journalist can ask in my view. To be certain, I had been very careful to ask the question with the proper tone of respect. And, despite a long-distance phone connection with static present on the line, it was obvious to me that Galadrielle understood and appreciated the spirit in which the question was asked. What struck me most about Galadrielle’s response was her focus on her hope that what she related in her book could help others in dealing with that sense of loss. After hearing her response to the question, I paused for a moment as Galadrielle’s words triggered a memory from my visit to Duane’s resting place at Rose Hill Cemetery in Macon. At the foot of Duane’s grave site, there’s an angelic statue with the name Galadrielle engraved at the base. Thinking about the work Galadrielle has done over the past few years with her book and the retrospective box set, the image of the statue at Duane’s resting place has become prophetic in many ways. Those candles that Galadrielle lit through the years as she recalled her father have ignited a tremendous creative curiosity. Through her efforts, Galadrielle is now carrying the torch that is illuminating her father’s work and legacy for generations present and for those to come. Yet, when considering the author’s voice and narrative style she established in her first book, one of the most exciting results of Galadrielle’s work is the trail she has blazed for her own future. In 2016, Galadrielle served as a contributing writer on Crime + Music:Twenty Stories of Music-Themed Noir. This compilation of short stories was edited by novelist and Wall Street Journal rock and pop music critic Jim Fusilli. Currently, Galadrielle is in the process of developing her first novel, and, during our interview, she seemed quite excited about the prospects for that book. After having the privilege spending a few minutes on the phone with Galadrielle, I was left with the impression that she is not only picked up the torch illuminating her father’s legacy, but she is also carrying the same kind of fire and passion with her writing that Duane brought to his music. I believe the next chapters of Galadrielle’s career hold the promise of many page-turning moments. Given her appreciation for her father’s dedication to his craft, it’s quite possible that Galadrielle may achieve the equivalent of Live at Fillmore East in her continuing work as a writer. To hear the interview from the MissingWordSolutions.com Vault with Galadrielle Allman, please click here.